Earlier this week we saw the press render for the Samsung Galaxy Tab 4 7-inch leak out thanks to Evleaks, now we’re seeing the Galaxy Tab 4 10.1 leaking out. It looks identical to the Galaxy TabPRO and Galaxy NotePRO which Samsung announced earlier this year at CES. Which really isn’t surprising. Even the wallpaper is the same. It’s also running KitKat, as evident by the white icons in the status bar. Additionally it does have that physical home button and recents and back capacitive keys at the bottom, which are also on the Galaxy TabPRO 8.4, 10.1 and 12.2. While the Galaxy Tab 4 10.1 does look a lot like the Galaxy TabPRO 10.1, I doubt that the specs will be close to it. I’d figure we’ll see an Exynos 5 or 6 chip inside, with a 1080p display, and probably 2GB of RAM. But the Galaxy Tab series are all mid-range tablets, especially if you look at what Samsung put out last year, while the Galaxy TabPRO is the high-end stuff for businesses and such. We’ve been seeing the Galaxy Tab 4 leaks for quite a while now and still no release date or even specs are available for these rumors and leaks just yet. I think Samsung is going to announce the Galaxy Tab 4 lineup pretty soon, complete with a 7-inch, 8-inch and 10.1-inch. Since Samsung did say they were going to release a lot of tablets this year, what’s 3 more for Samsung? It’ll likely be available in black and white, even though the press render is in white. We’ll also probably see the Faux Leather backing on the back which we saw initially on the Samsung Galaxy Note 10.1 2014 Edition and it continued with the Galaxy NotePRO and TabPRO tablets at CES. It’s a nice addition, although I like the feel of the black faux leather better than the white, it’s a bit softer. Is anyone out there interested in the Samsung Galaxy Tab 4 lineup of tablets? Let us know in the comments below. 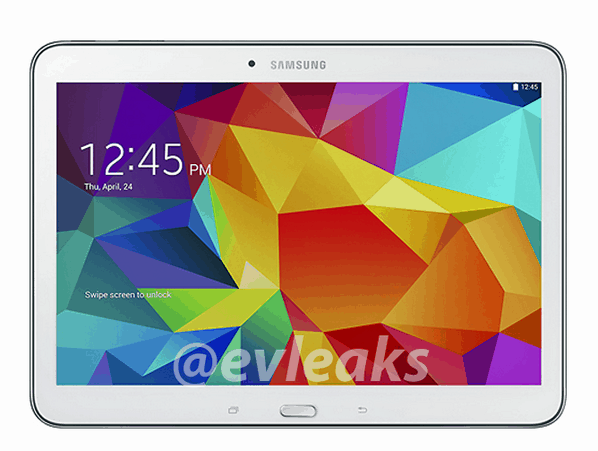 The post Samsung Galaxy Tab 4 10.1 Press Render leaks Out appeared first on AndroidHeadlines.com |.